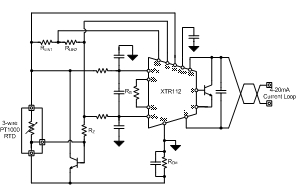 This design features a single-chip solution to linearize and transmit a 3-wire PT1000 RTD over the industry standard 2-wire 4-20mA current loop. The design was configured for a -50°C to 250°C temperature range, but other temperature ranges can be achieved by adjusting the component values as discussed in the Theory of Operation section of the reference design guide. 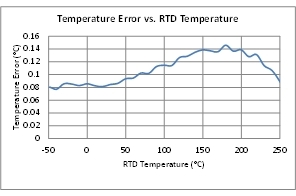 Unadjusted design accuracy was measured to be less than 0.15°C over the selected RTD temperature span.